This rich, fudgy gluten free chocolate sheet cake is a simple one-bowl chocolate cake recipe with an easy, poured icing. It’s just the best ever cake for a potluck or birthday. Is this a Texas sheet cake? When I first published this recipe in 2012, it was adapted from a recipe (linked in the instructions below) for Texas sheet cake. I didn’t grow up eating that sort of cake, but readers kept asking for a gluten free chocolate sheet cake recipe (of the Texas variety, they said!) so I did some research. Back then, to me, a “sheet cake” was a thick, bakery-style layer cake that was loaded with that amazingly delicious, who-knows-what’s-in-it, sugar-rush-style white frosting. A Texas sheet cake, it turned out was a thin cake baked in a jelly roll-style rimmed baking sheet with a poured icing. After the first try, I was in ❤. I guess this is technically a Texas sheet cake, still. But if I don’t call it that, I don’t have to worry about being told that I’ve done something nontraditional like sprinkling the hot poured icing with pretty nonpareils. A thin sheet cake like this one is so perfect for any sort of gathering, for a birthday or just a potluck. You know how adults often say, “I’ll just have a little slice”? Well, there’s no cake easier to customize in the size of slices than a thin sheet cake. And then when my youngest comes along and asks for the “biggest slice,” you can accommodate her too! If you’re hoping for a different sort of chocolate cake, here are 10 gluten free chocolate cake recipes for everything you can imagine. My favorite is probably the classic one bowl gluten free chocolate cake. And of course, if you’re more of a vanilla-type person, there’s always the very best gluten free vanilla cake. I think the secret to making a sheet cake ultra rich and moist like this one, is to make it no more than one-inch thick in a jelly roll-style rimmed baking sheet. If you were to use this recipe and double it, then bake it in a 9 x 13-inch baking pan, the slices would likely fall apart as you tried to remove them from the pan. Here, the pourable batter is made in one bowl, with melted butter, then smoothed out in a rimmed baking sheet. It’s baked just until the cake springs back when pressed gently. It can be a bit challenging to spread the batter into a perfectly even layer in the pan, but not to worry. The poured icing covers all inconsistencies. Be sure to pour the hot icing on the hot cake, and work spread out the icing quickly before it begins to set. The icing doesn’t harden, even when chilled, but it will set and wrinkle if you try to disturb it as it cools. The icing will likely have a few bubbles and lumps. They’ll even out as the cake cools, though. When I originally published this recipe, the cake was made smaller and baked in a quarter sheet pan which measures 9 x 13 x 1-inch. Despite the relative suggestion of the names of the pans, a standard quarter sheet pan doesn’t have half the capacity of a half sheet pan. If you’d like to make this cake in a quarter sheet pan, you’ll need to reduce the recipe by one-third. The easiest way to do that is to multiply each ingredient by 2/3. That’s a simple reduction for most ingredients, but requires some alterations for others. Dairy-free: When I recently decided to make this cake again, thinking it would be perfect for the long holiday weekend coming up in the U.S., the first thing I did was make sure it worked with dairy-free substitutes. And I’m happy to report that it works perfectly! In place of butter in the cake itself, I used half virgin coconut oil and half nonhydrogenated vegetable shortening (I use Spectrum brand). Both measurements are by weight. In place of the sour cream or Greek yogurt, I used a plain, unsweetened nondairy yogurt. Since the yogurt I used wasn’t thick enough, I strained it until it was the consistency of Greek yogurt, and then measured the proper amount by weight. For milk, I used unsweetened almond milk. In the icing, I recommend using all virgin coconut oil in place of the butter. Shortening has almost no moisture, and the icing has a tendency to seize up and end up too thick to spread. Egg-free: I haven’t tried making this recipe egg-free. The one egg could most likely be replaced by a “chia egg” (1 tablespoon ground chia seeds + 1 tablespoon lukewarm water, mixed and allowed to gel), and the egg yolk by another tablespoon of virgin coconut oil, melted. For a naturally egg-free and dairy-free cake, try my crazy cake gluten free chocolate cake. You won’t believe how moist it still is! Sugar-free: I haven’t tried making this cake with sugar alternatives, but I’m anxious to try. I’d recommend trying Lankato brand monkfruit granulated sugar substitute in place of the granulated sugar, by weight. Watch the consistency of the cake batter, though. If it seems too thick, as sugar substitutes tend to be drying in baking, add more brewed coffee by the teaspoonful until it seems similar to the texture you see in the video. In place of the confectioners’ sugar, Swerve has a confectioners’ sugar-style replacement that should work. Again, watch the consistency and add more liquid as seems necessary. Coffee: Since the only chocolate in this recipe comes from cocoa powder, without any melted chocolate, the brewed coffee really helps to deepen the flavor. Caffeine isn’t at all necessary, though, so brewed decaffeinated coffee is just fine. You can replace the coffee with water, but you’ll sacrifice flavor. Preheat your oven to 325° F. Line a half sheet pan (13 x 18 x 1 inches) with unbleached parchment paper and set it aside. In a large bowl, place the flour, xanthan gum, cocoa powder, sugar, baking soda and salt, and whisk to combine well. Set the bowl aside. Pour the melted butter, coffee, sour cream, egg and vanilla, and mix until just combined. Pour the batter into the prepared sheet pan, and spread into an even layer with a wet spatula. Place the baking sheet into the preheated oven and bake until the cake is uniform in color and springs back readily when pressed gently with a finger, about 20 minutes. During the last 10 minutes of the cake’s baking, make the icing. In a large bowl, place the confectioners’ sugar, cocoa powder and salt and whisk to combine well. Set the bowl aside. In a clean small saucepan, place the butter and the milk, and cook over medium heat, stirring occasionally, until the butter is completely melted. Remove the saucepan from the stove, pour the hot butter and milk mixture over the dry ingredients, add the vanilla, and mix to combine. Ice the cake. As soon as the cake is finished baking, remove the pan from the oven and pour the hot icing over the hot cake. Working quickly to ensure that the icing is spread before it sets, with an offset spatula or butter knife, spread the icing over the entire surface of the cake. Sprinkle immediately with the (optional) nonpareils. Allow the cake to cool completely in the pan to room temperature. For easier slicing, chill the cake, then lift it out of the pan by the parchment paper. Slice it into 12 to 16 generous pieces, and serve chilled or at room temperature. Adapted from The Spruce Eats. 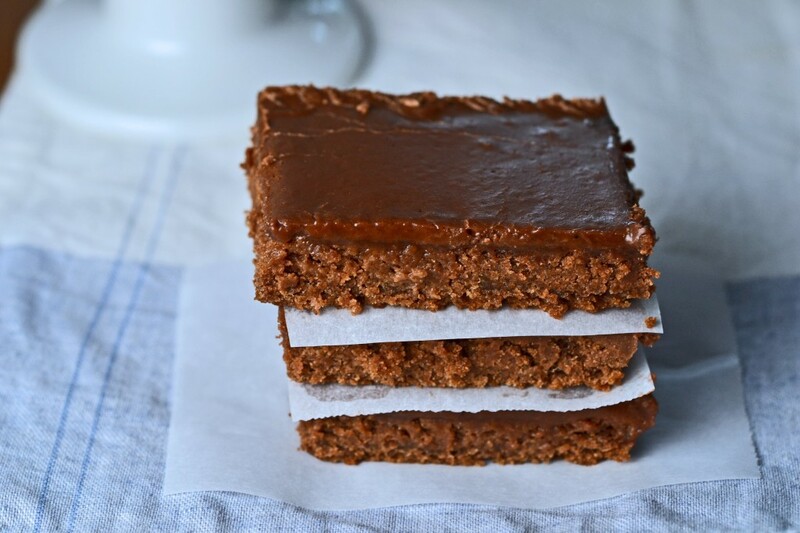 Originally published as Gluten Free Texas Sheet Cake on the blog in 2012 (!). Recipe scaled up 150% and baked in a half, rather than a quarter, sheet pan, photos and video new. Nicole, I made this a few days ago for my in-laws, who are not gluten free, and they had no idea. This was better than any other Texas sheet cake I’ve ever made (and I’ve made a few), and I can’t wait to try the vanilla version. Thanks for making Gluten Free baking such a joy!!! Wow, Jan. That’s high praise indeed! I hope you enjoy the vanilla version. I like it at least as much. This was soooo yummy. But the butter content has me a little nervous. I have a texas sheet cake from cooking light that I have always used. But now that I’m g-free I need to redo it. Any suggestions? When I lived at 3600 feet of sea level, I used to have to both increase baking temps and use extra flour. You might have to experiment a little to get the results you want. I totally agree that this is a great recipe even when more batter than cake : ) Thanks Nicole for giving us back our Texas Sheet Cake!! Thanks so much for chiming in to help out, Missy. Karrie, unfortunately I don’t have any personal experience with baking at higher elevations. From what I have read, though, Missy’s advice sounds spot on! Thanks, Missy! As you know, baking at altitude is ALWAYS an adventure! I’ll have to experiment with the extra flour and increase the temp to 350. If I figure it out, I’ll try to remember to get back on here and help out anyone else living up here in the thin air:-) And if I don’t figure it out, I’ll live on the batter! LOL! Ok, first let me say that the flavor of this cake is AWESOME! Made it this morning for my birthday and the chocolate had made me very happy:-) I do have a question that I’m hoping someone can help me with. I live outside of Denver at 5900 feet about sea level and the altitude pretty much always requires modification to baking times or temps. I baked it at 325 for 30 minutes and it’s still more batter than cake (mind you, that’s not slowing down the consumptions!). I’m thinking about raising the temp to 350 next time, but thought I’d ask if there’s anyone who has made this at altitude and figured out the exact trick? Thank you, thank you, thank you for the recipe…it’s made turning 40 a much sweeter experience! :-) And happy 4th of July! Made this for a family reunion (ok, I really made it for me but used the event as an excuse). THIS IS TRULY THE BEST CAKE EVER!! I had family members who hate GF stuff (that’s ok, more for me) love this cake! They kept asking me if this cake was really GF. Did they think I wanted to cause myself pain eating gluten? Regardless of their doubt, it was a very good cake. Now it will become my go-to cake for all events! I too was one who begged for this awhile back! I cannot wait to try it out on my family, this is one of our traditional cakes that appears at every get together. The recipe is quite similar to mine except this one uses coffee and ours uses some cinnamon. Many thanks Nicole! Your recipes are the best and I’m anxiously awaiting the release of your new book! I remember your asking after this cake. I had seen some recipes that call for cinnamon. I haven’t tried it, but you could definitely add some to this recipe. A small amount of dried cinnamon won’t affect the chemistry of the cake at all. I guess moist is the better word;) VERY very very very moist:) but it makes sense since there is only one cup of flour vs all the other ‘Wet’ ingredients. I’ve never made Texas sheet cake and have a question on texture. I just made the cake and it tasted delish ( i even used boiling hot coffee;) but the texture is not very cake-like , more mushy’ish. Which seems right since there is only 1 cup of flour . Just want to make sure i did it right and the texture is RIGHT on;)??? Megan, I am not Nicole, but I have been eating and making Texas Sheet Cake since I was a little girl. And that is a few decades! It is definitely a moist cake, but not mushy. It isn’t dense like brownies and it should be light like a cake, but more moist than a layer cake. It is sitting in my kitchen right now–half gone since I made it yesterday. But it won’t last long. It is addictive! I’m not sure what you’re referring to. Do you mean silpats, which are reusable silicone baking pan liners? They work really well, but they do tend to take a beating over time with a lot of use. You can definitely bake anything you like on parchment paper, but I really prefer unbleached parchment paper (the more flexible, brown kind) to bleached parchment paper (the thicker, stark white kind). Bleached parchment paper is much more likely to burn in the oven, too. I was one of those who begged in the original comment thread. Thanks so much for this! My husband swears he’s not going to try it so as not to ruin his memory of his mother’s cake (she’s not dead and will make it for him any time he asks, so I’m not really sure what he meant by this), but I bet when its done, he’s going to cave. Thanks again – you’re the best! I accept full responsibility, Kristi. And once you cold brew coffee, you won’t want to make it any other way. It’s so good! Oh yeah! My mom’s recipe for this is called Fudge Shortcake and I grew up loving it. Hers uses buttermilk instead of sour cream and no coffee. I am definitely trying your gluten free version. Thank you so much for your recipe, Nicole. I just pinned it. This was my favorite go-to recipe before going gluten free. Thanks for revising it so I can once again make & share this wonderful dessert with friends and family! You MIND READER! Ok.. tell me… what am I thinking now?! I have been eating Texas Sheet Cake for six decades and I was really missing it until you posted your cake flour blend when I finally tried it GF. Since then I have made it a few times. It’s is addictive! I have seen recipes with coffee and even some with cinnamon. I saw one that included 1/3 cup of cinnamon. Ouch! I like cinnamon but I was not tempted to try that version. I am not a coffee drinker so when I have made it with coffee, I did taste it. Other than the coffee, my version uses buttermilk (i use the dry buttermilk you recommended in another post). But no matter what versiion you try, Better Batter flour makes it good! And once you’ve made it, you will want to share it with your non GF friends just to see if they can tell its GF. Your comment reminded me that I use cold-brewed coffee when I make this recipe. I think it makes all the difference, since cold brewing coffee takes all of the bitterness out of even the most inferior coffee grounds. Not a soul tasted the coffee in the cake when I served it to a large gathering on Father’s Day, kids included. I smiled ear to ear when I saw this today. I make the regular version for my family and hate that I can’t enjoy it. Is the coffee brewed coffee, instant coffee granules, what? It’s brewed coffee. Actually, it’s cold-brewed coffee (all you do is soak coffee grounds in cold water for 10-12 hours, then strain out the grounds – a french press makes quick work of it, but it’s far from a necessity), which removes all the bitterness and acidity out of even the most inferior coffee grounds. It’s how I drink my coffee all summer long, and it all but ruins me for drip coffee the rest of the year. I’m looking forward to making this! I haven’t had Texas sheet cake since I went GF. It’s a bit hot in TX today for baking (high of 105), so it’ll be a little while before I can report on it. Thank you a million! Oh, no, Carol! We had a heat wave like that in NY last week, and it was brutal. I know that can last for a long, long time in Texas. I’m pulling for a cold snap for you! I know I’m getting hung up on a silly detail, but I have a question about lining the pan with parchment paper. Do you lift the cake out before cutting? Do you leave it in the pan and just be really careful not to cut thru the paper? I don’t want to damage my precious USA pans . . . . . This recipe is EXACTLY like mine with the only difference being the gf flour! So YAY!! That’s so interesting, Angela, since none of the other recipes I found were exactly like this. Similar or same ingredients in some, but different proportions. I hope it turns out well for you! YEAH!!! I used to make Texas Sheet Cake all the time but haven’t since being gluten free. Thank you! I’m so glad, Autumn. This cake is too good to have to do without! Oh my! I can’t tell you how excited I am to see this recipe. My (Texan) mother would make the non gf version of this for special occasions and holidays growing up, but now that I’m gluten free I haven’t had it for years. Can’t wait to try this out. Thanks! I hope it lives up to your memories, Cocina! I’m out of butter so in a moment of desperacy, because I must make this cake, have you ever subbed coconut oil for the butter in baking and had a positive result? I would really consider going to pick up some butter! This cake is so butter heavy, and coconut oil is great but it really does taste like coconut. you can buy the coconut oil that doesn’t not have an order nor flavor at Toprical Traditions. It is called Expeller pressed. then it wouldn’t change the taste of the cake. I use the same kind of oil for my massages oil blends as it doesn’t interrupt the essential oil fragrance blends I use. I’m glad you have found something that works for you. In my experience, however, even expeller-pressed virgin coconut oil (the kind I use as well) tastes at least faintly of coconut, especially when it is used in the quantities that are called for in this cake and icing. Oh thank you!!! I was dreading making this cake at Christmas this year for family with being able to lick the spoon! O Nicole, please never stop. You are my lifeline for sharing food with family & friends. First cookbook is dog-eared. Anxiously awaiting your second! Thanks, Patti! I don’t have any plans to stop. For the first time in my professional life, I know I’m in it for the long haul. which I found by going through my sent emails. I had sent the link to my mom because she is a huge Texas Sheet Cake fan. Do you know how long it takes to go through all your sent emails? I had no idea! So happy to know you are in love with this cake! I will be using your recipe now, instead of tweaking my own, cause I know yours will be awesome. I’ll need it in a couple months for my husband’s birthday, but I might be making it today, too! I agree that a half-sheet cake is a lot of cake, but it seems pretty easy to consume this one in a day or two . . . all by myself if necessary! That’s it, Anneke!! Thank you so much! I looked back through about 2 weeks’ worth of posts, and then gave up. My search feature doesn’t crawl through comments, it seems, so it was useless. You can definitely get away with making this every so often, Anneke. It’s so easy, and a quarter sheet pan isn’t too much at all. I could power through a half sheet pan, no doubt, but I’d prefer not to, especially in this weather where it’s harder to cover up! We had a crazy heat wave last week in NY, but this week is much cooler so far. Hope you’re not suffering!